On a Friday afternoon, I had received a piece of great news. I was so excited, and went home to call my Dad on the other side of the country to let him know. He wasn't home, so I left him a voicemail, asking him to call me back. He didn't call all weekend. The phone finally rang on Monday...and it was my Aunt. "Your Dad is gone." I couldn't believe it. How could that be? It wasn't news I had expected to receive; but he was gone. Just like that. I stumbled around in a fog, booking a plane trip back east, arranging pet care, trying to focus on putting one foot in front of the other. And I'll never forget a trip to the store that day. I stepped to the counter with my items, and set them down. I don't remember what I was purchasing, perhaps pet food. I don't have any idea what my expression was, or whether I had those puffy eyes you get from crying. But what I do remember: the cheery clerk. She gave me a winning smile, and in her perky voice, she asked, "Did you find everything okay?" I stood there in shock. I didn't know what to say. I had an urge to reach out and grab her by the shoulders. I wanted to say, "Don't you know? Don't you see the world just stopped? How can you be smiling?" 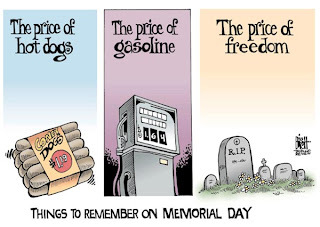 This Memorial Day, so many families are asking that same question. "Don't you know? My loved one is gone. Forever. Don't you know the world just ended?" 3,745 cards were shipped out this week, at a cost of $137.50....and that takes us to a total of $950.00 in shipping for the month of May! 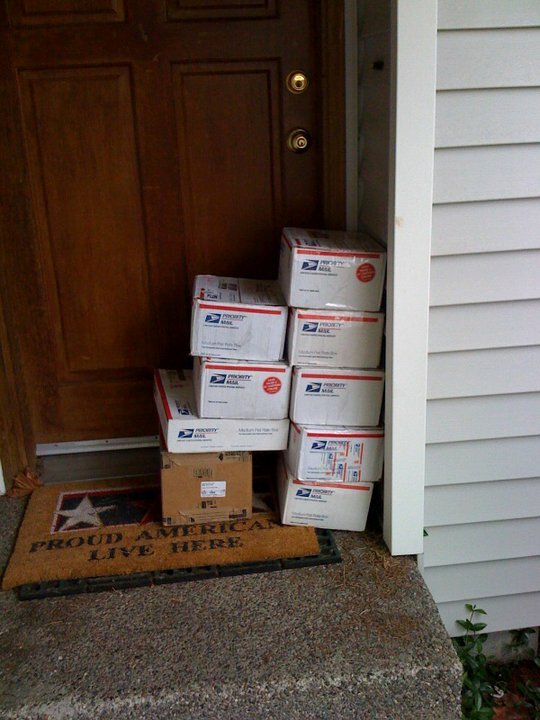 Our shippers are anxiously awaiting the final Fourth of July cards to make it in time for our heroes to mail home for the Independence Day holiday. 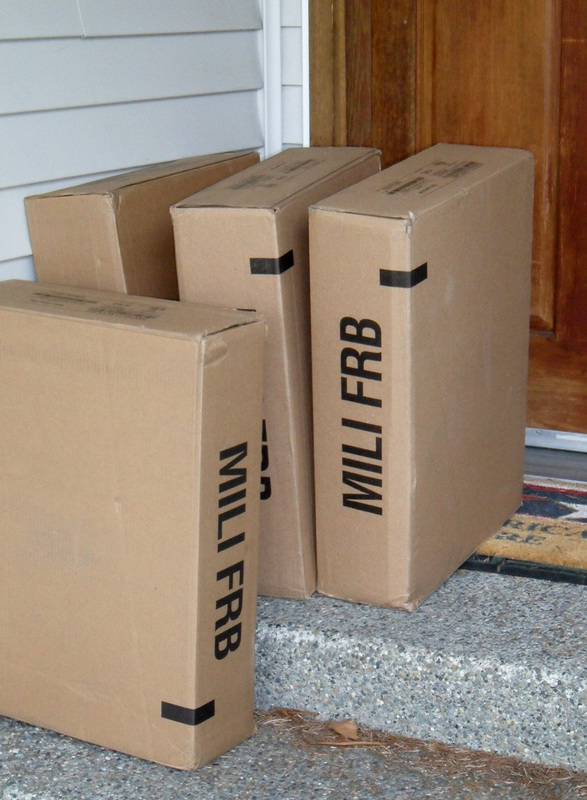 Typically, we assume approximately 2 weeks for our boxes to travel to our contacts, and two weeks to return home. 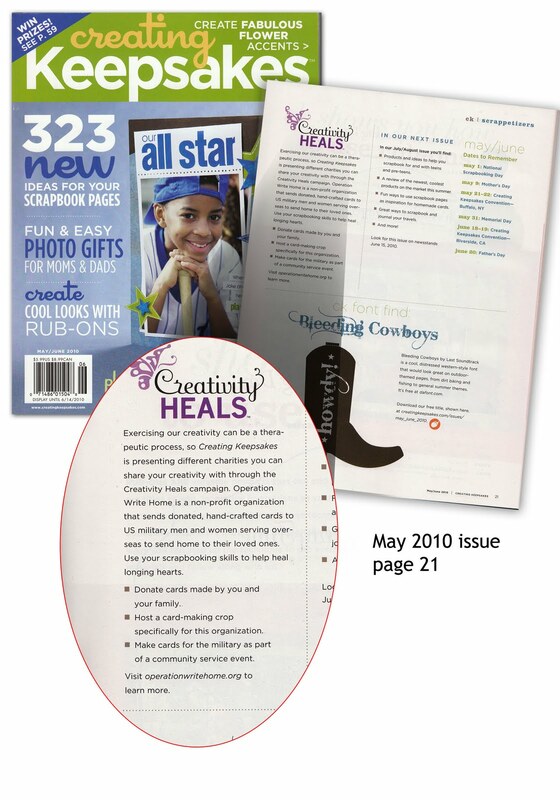 Those are often much less than is actually needed, which is why we request that our cardmakers attempt to 'beat' the published deadlines; we begin sending cards for a holiday 8 weeks prior, often, if we have them. So if you can help out by being early, that helps our heroes tremendously! Independence Day: June 1, tomorrow! * Note: You can keep making patriotic cards all the time, just don't put "Happy Fourth of July" on them. Take advantage of those great sales on patriotic papers and supplies! Welcome to the last stop on the hop! But please don't skip out on us — we've got something great for you here!! You know you love 'em...how about some more free digis! These are from The Stamping Boutique - thanks so much for these, Tracey! This is a full sheet shown here (click once on this thumbnail, then right click on the 2nd image to download it), or you can download a zip file with each digi individually. These will be available on our Free Digis Page. We have ten - yes TEN - flat-rate boxes full of cardstock to give away! This is part of the huge stash of paper donated by Pollard Group in Tacoma WA—it was formerly destined for printing ballots, and is now to be made into cards for our heroes! Just think how many cards you'll be able to make for our heroes with a box of that paper! To enter, leave a comment on this post telling us what you thought of the hop—what inspired you? Do you have a goal in mind after all you've seen? 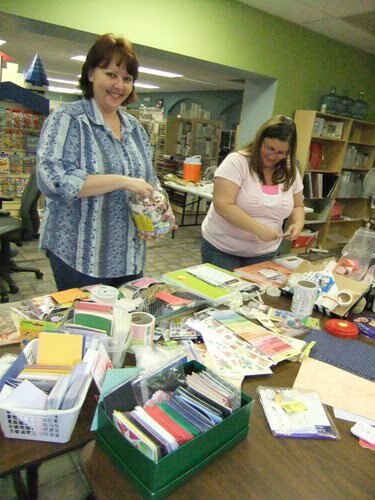 Are you going to set up a cardmaking party? Let us know if this hop motivated you! We'll draw 10 winners at midnight Monday night (Memorial Day) using random.org....please leave your email along with your comment (write it "myname at server dot org" instead of "myname@server.org" so you don't get unwanted spam!). Did you miss the signup? Or perhaps you didn't know about it til now? Well, you can still join in the fun! 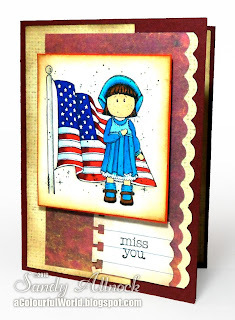 Use InLinkz below to link your card inspired by today's hop - a red, white, and blue missing you card! PERFECT belated Father's Day cards! On Bloghop-eve, here's a fun tip for you from cardmaker Leslie in Utah. 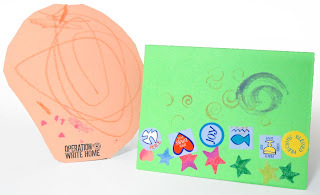 She sent her box late, but just look at what was in it....a dozen had specifically said "Happy Father's Day," but look at these - they can work as general cards for Dads too! These will make it into the next boxes, but if they don't zoom to Iraq or Afghanistan in a speedy fashion, our heroes can still jot a note to dad later! So if you know you're often pushing deadlines....think about making general cards like this. 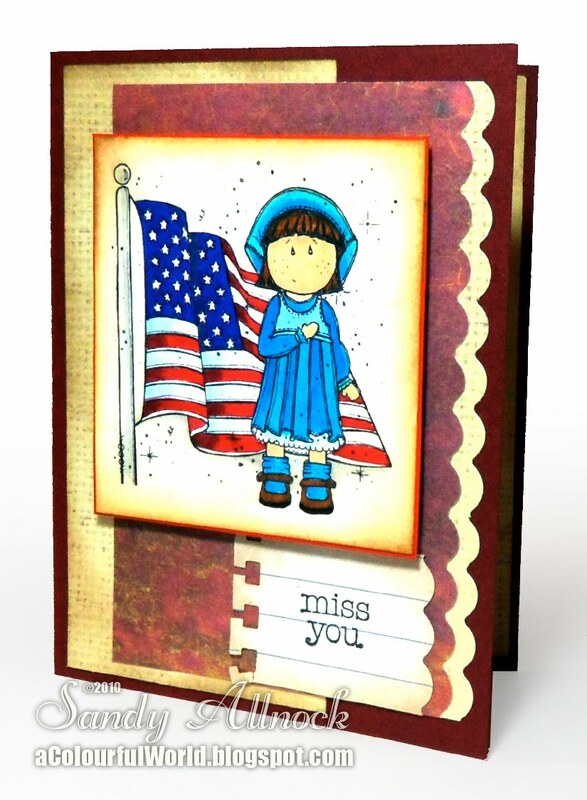 Cards with pumpkins that say "thinking of you," snowman cards that say "I love you," and — since the 4th of July deadline (June 1) is breathing down our necks — patriotic "missing you" or "hello" cards! Then if you're delayed on the way to the PO, it's still okay! 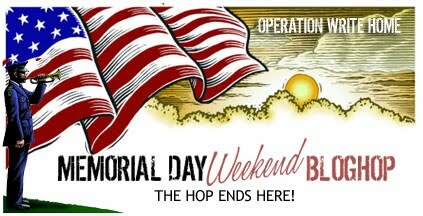 See you tomorrow at the hop! It'll start on our sister blog, Stars & Stamps, so be sure to go bookmark it now so you're ready!! Cristy D of Charlesto, WV, thank you for all these beautiful cards for our heroes. Many thanks too for the extra goodies you sent for the troops! You rock! Thank Ewe Lori R. in Springfield, VA for these cards for our military heroes! So many different designs! They're "the perfect blend!" Thank you Caro H of Mint Hill, NC for these cards!! Thanks for the hero mail too!! Good thing you came to the crop tonight...we'd have had to talk about you if you hadn't!! Thank you Judy A of Pulaski, TN for hosting an event to make these beautiful cards for our heroes! And thanks for sending a picture of the group! Many thanks to Linda G of Bradyville, TN!! This box of cards is beautiful! Thank you for your hard work! Thanks, Carole H of Hohenwald, TN! This box of cards is just wonderful! Your group did a terrific job!! Thank, Tammie H. of Pilaski, TN!! What a terrific box of cards your group sent for our heroes!! Thank you Martha H of Pulaski, TN!! What a terrific box of cards you all sent. Many thanks! Thank you Barbara J of Pulaski, TN! This box of cards will make lots of heroes happy! Thank you Tiffany L of Pulaski, TN! This terrific box of cards will put lots of smiles on our heroes faces as well as their family and friends! Thank you Erica S of Murfreesboro, TN for this wonderful box of cards! Your group rocks! Thank you Christy S of Pulaski, TN! This box is just full of lovely cards for our heroes! Thank you Kin S of Pulaski, TN! Your group sent a great collection of cards for our heroes! Thank you Joseph W of Pulaski, TN! This great box of cards will be put to good use - helping our heroes keep in touch with home! Thank you Shannon W of Lawrenceburg, TN! This box of cards is just what I needed to send to our heroes! Many thanks! Thank you Zada T of Hohenwald, TN for all these terrific cards! So many designs and sentiments! Wonderful! Many thanks to Ruby L of Ethridge, TN! Great cards from a great group of people! Laurie J, Houston TX - thanks so much for the great package of cards! Laura C, University Place WA - wow, thanks so much for the beautiful cards! Mt Cross Evangelical Lutheran Church, thanks so much fo the wonderful Independence Day cards! Denise W, N Las Vegas NV - thanks for the treats for our heroes! Brooke and Dakota W, Spokane WA, thanks so much for the great cards - and AnyHero cards!! Gabrielle L, Hubert NC.....thanks for this great box of cards! Love them. Karen L, Glen Haven CO.....thanks for these awesome cards! Amanda C, Midlothian TX......beautiful cards! Thanks so much! Betty T, Salina KS - thanks for all the great prizes to share!! Kimblerley M-Y, Kennewick WA - it was such a delight meeting you and your hero - and another delight looking through these boxes full of cards! Thanks to you! 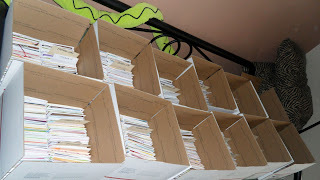 Lynn M, Simi Valley CA - thanks so much, this is a really great box full of cards! Janis L, Anchorage AK, your cards are wonderful, thanks so much! Lina W, Hampton VA - thanks for the wonderful birthday cards! Betty and Marilyn S, Columbus OH.....thanks for these awesome cards! Thank you to the Warren 1st Church of the Nazarene Youth Group in Streetsboro, OH!! Well done! I see a lot of love went into each and every card! Thank you Janet K of Austin, TX!! I just love the cowboy paper you used on these cards! Perfect choice for the sentiments! Thank you, Bertha M of Toronto, ON!! Beautiful cards for our heroes to send home to family and friends. Thanks too for the Hero Letter! Thanks Lisa S of Jacksonville, FL!! Your cards are so patriotic! Made me want to sing the Star Spangled Banner! Thank you Alisa W of Henagar, AL for the cards! They are just beautiful! Joan B, Alton Bay NH, thanks so much for the great cards and donation - you are a blessing! Thank you, Kaki D of Lacombe, LA for the terrific variety of cards, the shipping donation, and the hero mail! I'm still chuckling over the googlie eye frog card!! Jennifer P, Amarillo TX.....what an awesome first package of cards! These are awesome! Many thanks to Sharon S of Whitehouse Station, NJ and the MADD Stampers Club! What a terrific collection of cards! So many beautiful designs! Thanks lots for the Hero Mail and the shipping donation! 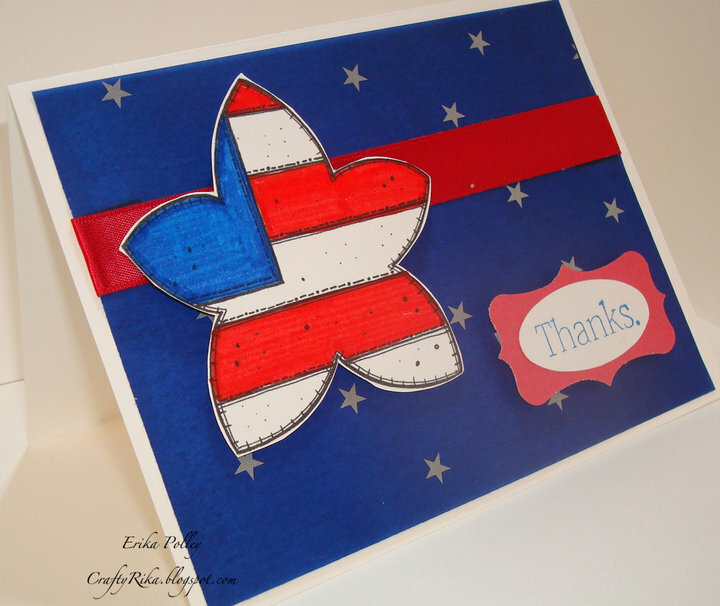 Paula P, Rathdrum ID - you just keep blessing our heroes with your creations, thank you so much! Your financial gift is a huge help too! Teresa K, Vancouver WA - beauuuuutiful cards, our heroes will love them! Thanks so much for your donation too! Renee H, Andover MN......thanks so much for these great cards. Love them! Lindy C, Seattle WA - wow, fabbbbulous cards, and such a generous donation - thank you! Jack B, Lake Oswego OR - WOW! Not only happy 9th birthday to you, but to our heroes too....thank you for all the great cards for them, and the wonderful donation you collected at your party! Thank you Carol L. of Gilbertsville, PA!! Surgery did not diminish the quality of your lovely cards! Take care!! Thanks, Marge M. of Wayne, NJ!! These cards are terrific! 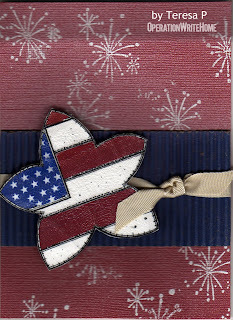 I especially love the 4th of July cards! Felt like I needed to salute! Thank you Kate W. of Midway Park, NC!! 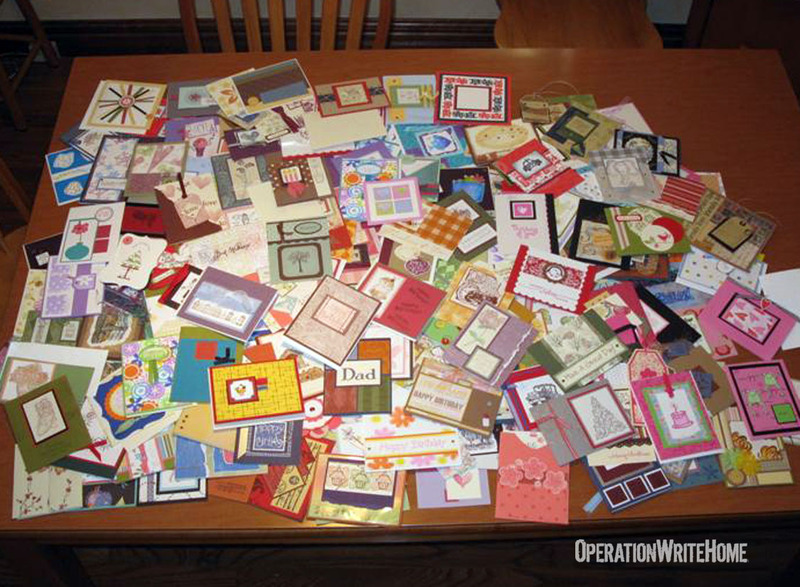 You sent such a nice collection of handmade cards for our heroes to send home to loved ones! Thank you Sandi W of Mayfield Hts., OH for ALL these terrific cards for our heroes! You sent so many beautiful designs! I'm looking forward to getting a closer look at them! Thank you Celeste L and your children of Panama City Beach, FL for the terrific collection of cards you sent for our heroes! Many thanks too for the letters written to Any Hero! All are most appreciated!! Many thanks to the ART Haven Yahoo Group of Panama City Beach, FL for the terrific cards you made for our heroes. Your work is much appreciated! Just beautiful! Laura O, Cottontown IN - another fantastic box of cards, wow! Thanks!! Trinity B-K, Springfield OR - wow, these cards are so cute! Thanks so much! Denise W, Las Vegas NV - so glad your mojo has returned - these are awesome! Thank you, Grace C of Collegeville, PA and GS Troop 7188! Your cards are great and I hope you get that Bronze Award! Well done! Thank you too for the shipping donation! Sharon L, Tacoma WA - thanks so much for the cards, donation, and the prizes! 14,790 cards were shipped out this week! What would 14,790 cards look like? Here's a little experiment you can do at home to find out. Take your regular folding craft table, 30 inches x 6 feet surface, and invite all your neighbors to bring theirs out to your street too. Put out 174 of those tables. (Now THAT is a cardmaking party!) Then cover each and every one of those tables with a single layer of cards. THAT is 14,790 cards! Or try this. Go out to your street with your box of cards, and start laying cards in a row. End to end. Keep on going for a mile and a half. THAT is 14,790 cards! 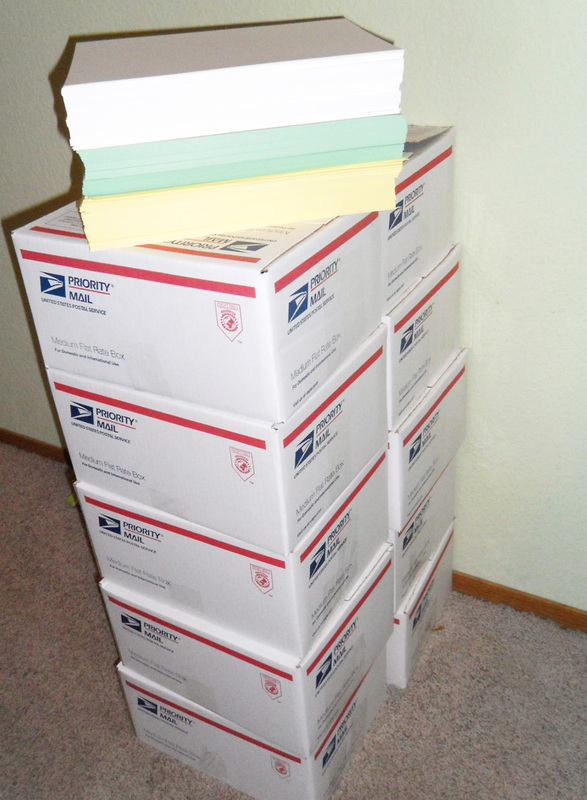 The way OWH counts them, that's 44 boxes, shipped at a cost of $550 this week. In one week alone! Our shippers did an insanely amazing job as always!! Thank you so much to all of you who donate funds along with your cards - when we combine all our gifts, we have enough to cover our costs!! Independence Day: June 1* Note: You can keep making patriotic cards all the time, just don't put "Happy Fourth of July" on them. Take advantage of those great sales on patriotic papers and supplies! News from the homefront—even from strangers—is a treasure to those far from home. "Hero Mail is great," says one Chaplain. "I go out and pray with the soldiers before missions and I hand out Hero Mail." Letters are distributed to those who rarely get mail, or to those most in need of encouragement the day the box arrives. "It helps to know that we are remembered!" Following are a number of the most often-asked questions about these letters. "Why are they called AnyHero letters?" When a letter is addressed to AnyHero, it can be given to someone from any branch of service; a note written to "Dear Soldier" is appropriate for someone serving in the Army, but since many of our contacts are with mixed units, using "Dear hero" as the salutation gives them the freedom to pass it on to whoever needs encouragement the most. "How often do you send these?" In every box, if we're able! That means weekly we need more cards and letters. "How do I even know what to say in a letter?" If you've got the gift of gab—or if all you know is how to write "thanks" and sign your name!—you can write a letter that will encourage a deployed service member! Letters can be long or short, on a card or a piece of typing paper, chatty about life at home or just a brief message of gratitude. Just keep it upbeat—even a fun weather report, a story about something your chlid said, or a clipping from the funnies brings a little piece of home to a faraway land! Check out this great collection of poems that have been written by our own OWH family by clicking here! "Do I sign my note with my full name?" You can do whatever you feel comfortable with; preference is at least first name and hometown/state, but you can put your contact information in a letter as well. Those who receive it may or may not write back, but it's possible you could get a message back. "Can I write just one?" You bet! We'd love to receive one AnyHero letter in every box of donated cards if we could! The more love from across America we can share, the better. "How do the letters get distributed?" Each of our boxes of blank cards goes out with a package of Hero Mail; the contacts who receive them then share the mail with those who get the least mail from home, or to someone struggling and in need of extra encouragement. 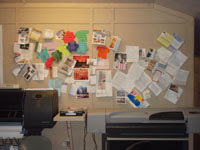 Some post all the mail, as seen in the photo above; others tuck a note into their pocket to carry with them on missions. "Can my kids draw pictures to send?" Absolutely! We hear from so many heroes who love to hang up kids' art on the walls around them. Please refer to our school and scouts post for guidance for your children, whether your own, your school, or a scout troop. A number of folks have been asking about the backs of the cards, and since we have so many new folks joining us since the magazine articles, here's the skinny! 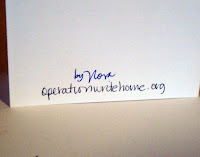 The reason for putting "Operation Write Home" on the backs of the cards is to let our heroes and especially their families know where the card came from. We love hearing from them...and we've had a number of new cardmakers join us when they've received happy mail from their heroes! If cards arrive without Operation Write Home on the back, our shippers do the labor of stamping them—we appreciate when you're able to do that before mailing them in! It saves so much time, keeps our Card Hospital low on patients, and since our shippers are all volunteers, we love to make life easy for them whenever we can! If you're including envelopes and not stamping the backs, please don't tuck the cards into the envelopes; we just have to take them back out anyway. You may include your name, your address, email, etc on the back if you wish. Please remember, however, the back of the card isn't a billboard; don't fill it with lots of stickers and stamps, some of our heroes want to write a long letter and continue it on the back, so leave them space to do so. Cards you've received in swaps are acceptable; we leave the stamper's info on the back — aside from card "recipes" - we do remove those. It's way too much "insider" info, causing our heroes or their families to wonder what that giant list of items is! So we cut off the fronts and re-mount them to new cardstock, which also means those cards land in the Card Hospital to await having time to be able to fix them. Yes you may use your own stamp with your name or whatever you would like on the backs of your cards. No problem! Some put their address or email on it as well. Labels are also fine; you can combine the two and create a label with your name *and* Operation Write Home on them. Handwritten is also perfectly acceptable too! Saturday we sent a bloghop confirmation email to all known blogger participants - if you did not get one (please check your spam folder!) 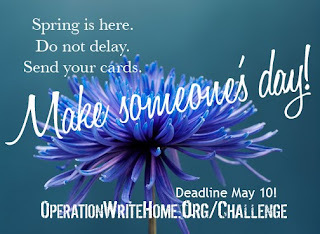 then send an email to bloghop@operationwritehome.org.... We've missed people in the past, or have fallen into spam folders, so we're trying to have all that happen before the links start going out! "Dear hero, I cut this out by myself. I like to go swimming. I like to go to Fred Meyers. I went camping this weekend. I like to ink my stamps and make cards. Dakota, Age 2"
"Dear hero. I like to swim. I like to do stuff all by myself. I like Mac-n-cheese and pears for lunch. I love you, come home soon. Thank you. Dakota, girl, age 2. Spokane WA"
Our cardmakers have been so productive this week! 7,212 cards sent in by 87 people (many representing whole groups)...wow! Our heroes are so blessed to have so many Americans working so hard on their behalf, thank you for your efforts!! 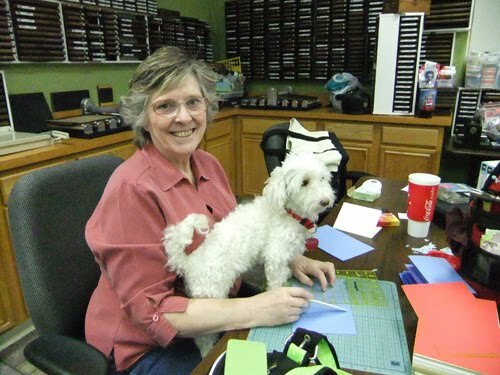 The photo here was sent in a few weeks ago by a cardmaker, Pam...send us a photo of you and/or your cards sometime! Cheryl B of Havelock, NC, your terrific Fathers' Day cards arrived at the perfect time! They re packed and ready to go! Thank you for those cards and the hero mail too! Thank you Susan F of Smithsburg, MD for the cards for dads! You and I obviously do our best crafting when the deadline looms! LOL! Thank you, Rosey for the cards! Great job! Again! I packed the grad cards in boxes to go out tomorrow! Thank you, Laurie W. in Evans, GA! Your cards are so neat! I'm still laughing over the birthday card with the fire extinguisher! Funny!! Thank you Mabel Mc. of Madison Heights, MI!! You made such lovely cards for our heroes! Thank you too for the terrific Hero Mail! So glad you found OWH!! 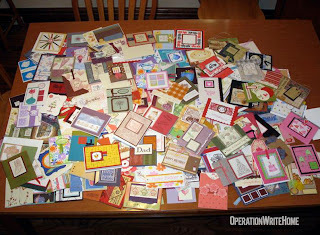 Joy O. of Carmel, IN, thank you for this huge collection of pretty cards! WOW!! So many different sentiments and styles! Thank you!! Michelle S. of Bucyrus, OH, thank you for the cards! The patriotic ones are my favorites! Thank you too for the letters to heroes!! Really needed those! Jody V of Chester, VA, thank you for these beautiful cards! You sent such a nice variety! Many thanks for the hero mail from your daughter's 3rd grade class! They rocked it! Thank you Jennifer m of Coral Springs, FL for your clever cards and generous donation! Our heroes will love sending these to their dads! Thank you Judy K of Oxfordville, WI for yet another beautiful collection of cards! Love the silver stickers! Thanks too for the generous donation! Thank you, Courtney K of Tarrytown, NY for your delightful cards and generous donation! Our heroes will love these cards! Thank you Shirley S. of Columbus, MS!! You sent the most entertaining box of cards! I'm still chuckling over the rock cards! Thank you too for the generous donation and the hero mail. You rock! Shaleice B, Mesa AZ, thanks so very much for your package of cards! Carla D, Sublimity OR - thanks for the card followup to your donation - you're awesome! Sheila G and swap friends, Puyallup WA - thanks so much for your great package of cards! Many thanks, Katrina g. in College Park, MD! Your cards are beautiful! I love the "A wise man once said..." cards. Too funny!! Shelly H, Twin Falls ID - love your cards, they're soooooo cute!! Nicolette S, San Leandro CA - what a great batch of Dad cards, thanks!! Kathy S, Reedley CA - thanks so much for the package of cards --- they're lovely! Georgy T, Klamath Falls OR - thanks so much for the cards! Rebecca W, Fort Lewis - your cards are so cute! Thanks for the dropoff too, it was nice to see you! Tami W, Salem OR - your boxes of cards are always such a treat - thanks! Beckie Y, Battle Creek MI - what a great AnyHero letter - you're going to make someone smile hugely! Thank you Stephanie G and Robin G of NY, NY for the beautiful cards, generous donation, and thoughtful hero mail! Love those circle punch cards and that big dot stamp!! Thanks Cathy B of Columbia, SC for the cards , hero mail and generous donation! Perfectly packaged, beautiful cards made my day! Thank you! Jann H, Ravensdale WA, I love your cards, thanks so very much for the donation too! Kara K, Akron OH ...thank you so much for your generous donation! Many thanks to Kimme L of Westminster, MD, Jimmi M of Suffolk, VA, Karen P. of Dallas, TX, Dawn Marie B. of Glenburnie, MD, Kathi C of Ferndale, MD, Jodi M of Westminster, MD!! Wowzers! You ALL are my heroes today!! Wonderful cards for our heroes! Thank you Diane G of Barberton, OH for yet another wonderful box of cards for our heroes! I love the shiny sentiments! Classy! Thank you Kathy B of Sarasota, FL for the clever Fathers' Day cards you "stitched and ironed." Thank you too for your family's service to our country! Thank too for your generous donation! Many thanks, Roxanna Mc. of Pickerington, OH!! Your cards are delightful! Our heroes will love these cards! Thanks for sending such a nice variety! Thank you, Rebecca P of Virginia Beach, VA!! These cards are wonderful, and I really like all the "bee" cards! So clever! Thank you for sending so many nice Any Hero cards! Thank you Elaine H of Keene, NH!! These Fathers' Day cards will bring a lot of smiles to a lot of dads! Thank you Carole G of Tuxedo Park, NY for these cards! They are simply lovely!! our heroes will love them. Thank you Denise D of Alexandria, LA for these terrific cards for the fathers of our heroes! These are great!! Thank you Deloris T and the SCAL Users Group of West Salem, OH! What a nice collection of cards you sent! Thanks too for the hero mail and the donation! You rock! Thank you Judy G for the terrific cards, generous donation, and many letters to heroes! I just love the way you use patterned paper! Thanks too for the perfect packaging! My Hero! Thank you Debra K of Naples, FL for the cards for the dads of our heroes! Well done!! Thank you Joan JF. of Atlanta, GA!! I just love your cards and I know our heroes will too! Thank you too for the hero mail! Michelle S, Santa Maria CA - thanks so much for the lovely cards!! Maggie J, Cranberry Twp PA, love love love all your cards, thank you! Your donation is a huge blessing too! Lina W, Hampton VA, thanks for all your faithful packages, your cards are wonderful. Hugs! Chris C, Parkland WA - thanks sooooo much, you've poured out your heart in all these! Erin K, Bellingham WA - what a great first batch of cards!! Thanks so much! Jean N, The Picture Attic, Long Beach WA - wow! Thanks for this box of lovely cards, they're very pretty! Pam C, Arroyo Grande CA, love your cards --- thank you!! Leslie Y, Logan UT - thanks so much for your packet of cards! Thank you Kathy C of Ilion, NY and your friends Cindy, Lillian, Julie, Terry, Linda, Loraine, Dorothy, Pat, Tina, and Dottie! Wow!! What a nice box of cards for our heroes! You all rock!!!! Dorothy B and Lee H Elementary school students and principal Elizabeth M, Corpus Christi TX......Thanks for all these great cards and Any Hero letters! Jamie F, Independence MO......Thanks for the great Father's Day cards. Brandy P and MOPS at Northeast Bible Church, Cibolo TX.......thanks for this great box of cards. Michelle M, Cheyenne, WY......great cards!!! Thanks so much. Christy S, Londonderry NH......thanks for the beautiful cards! Jennifer N, Sioux Falls SD.......thanks for these great cards! Pam B, Ceylon MN......WOW! What an awesome package of cards!! Andrea J and Wisconsin Scrappers in St Germain WI......thanks for these great cards made at the weekend crop. Lindy M, Warrensburg MO......thanks so much for these wonderful cards. Marietta W, Akron IA.....awesome Father's day cards. THANKS! JoAnne N, Romeoville IL......love these cards with the shirt folding...great job! Connie C, Joliet IL.....thanks for these beautiful cards! Jennifer M-H and Trevors Tuff Mamas, Knox IN......thanks for another awesome package of cards! Chris F, Monument CO.....Fabulous Father's Day cards! Thanks! Sharon N and Ladies of Waterloo IL......WOW! What an awesome package. These are great! Leslie C and Spirit House Ministries, Georgetown TX.....thanks for these wonderful cards!!! Cindy M and Friends of Checkered Cottage, St Louis MO....WOW! What an awesome box of cards.....THANKS! Joan K, Avon IN.....thanks for the awesome package of beautiful cards! Lori V, Black Creek WI.....wonderful cards!! Love them. Martie M, Dayton OH.....AWESOME package of great cards! Jennifer P, Chicago IL.....thanks for the great cards! Debby P, Buffalo MO......awesome Father's Day cards!! Nancy K, Hattiesburg MS.....thanks for the wonderful Father's Day cards! Cindy M, Normal IL.....another awesome package of great cards!! Thanks! Susan T, Cypress TX.....Love these Father's Day cards....they rock! Ms Ruling, Unadilla NY.....thanks for the package of great cards. 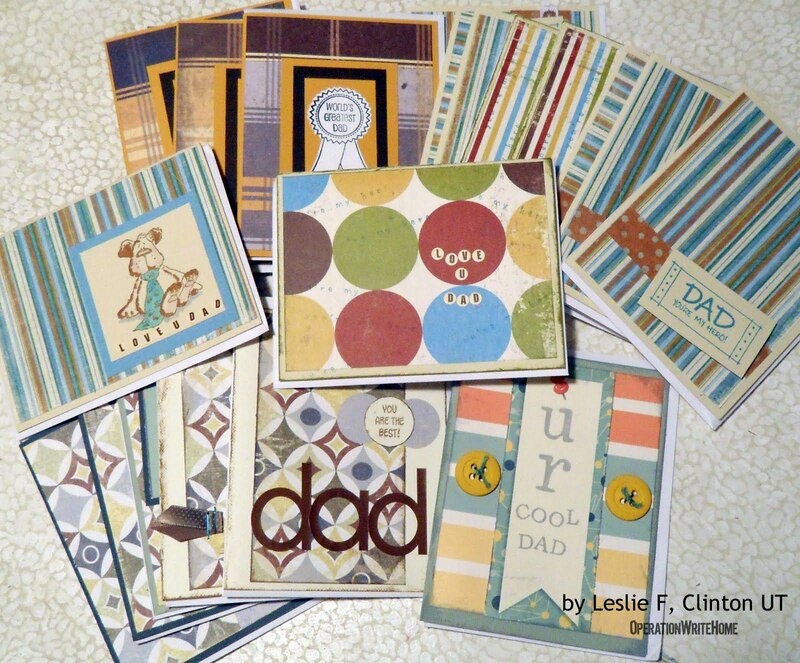 Marteena S, Hillsboro OR - thanks so much for all these great dad cards! Wow!!! Helen S, San Diego CA -- what great cards for the 4th!! Thanks for your cash gift too! Crystal P, United Health Care, Chico CA - these cards are so cute! Our heroes will love them. Jan C and the AZ Scrappers, Phoenix - these are so pretty, your boxes are always filled with treasures. Thanks so very much for your generous donation too! Debbie H, Chapmansboro TN - wow, what a beautiful box of cards, LOVELY! Thanks for your cash donation too! Many thanks to Debbie S and Wanda A of Gastonia, NC!! You always send such pretty cards for our heroes! They're so bright and cheerful! Lots of summertime in that box! Thank you too for the generous donation!! Thanks, Cindy Q of Naples, FL for these awesome cards for our heroes! WOW, so many different designs, and all made with love! Many thanks, Martha C. of Zepherhills, FL!! You sent terrific cards for our heroes to send home! Thanks to for the Hero Mail! Those will be treasured! Many thanks Meredith T. of Zephyrhills, FL for this beautiful collection of cards for our heroes. Your Hero Mail is most appreciated! Love the combat boot cards especially!! Thank you Maeve S of Knoxville, TN for these great cards for or heroes! I love the card with the "postage" stamps and ferns! Thank you Cheryl B. of Claypool, IN for these lovely cards! I love the lace butterflies! Just beautiful!! Our heroes will love sending these! Check out all the décor that our Facebook fans posted on Archway's facebook page yesterday! We love your company and its idea to send handmade cards to our soldiers. In honor of Armed Forces Day last weekend, Archway Cookies dedicated its status message to all of our heroes and your organization. I just wanted to let you know. Thanks again for everything you do! Thanks again for the shout-out, Archway! 3410 cards were shipped out this week! That's 10 boxes, shipped at a cost of $125 this week. Stay tuned next week...we have about 30 boxes awaiting the final Father's Day cards to tuck inside, and they'll be on their way! Hip Hip Hopping Countdown: 107 blogs! It's less than two weeks away til the bloghop! Soooooo exciting! Some of you might be interested in a little preview of what's coming....you'll want to block out some time to check out the inspiration! The hop opens 10am EST on the 29th, and that's 7am PST. Haven't signed up yet? Click HERE to get on the list! Total blogs so far: 107!! We've heard rumors of some amazing candy, free digis, and so much more! Had so much fun in the spring... gotta do it again! Thanks for a chance to participate and show my thanks to the men and women who risk their lives for my freedom. I joined in your last bloghop and had a blast - can't wait to hop with you again. I will also be offering to make 1 card for each comment left. I will be offering to make 1 card for each comment left. How have I overlooked you for so long?! This sounds like a wonderful idea and I am looking forward to participation. I'm going to encourage everyone who reads my blog to send an AnyHero card, even if they are not cardmakers. I also am going to be doing AnyHero cards and letters in my classes the week leading up to the Bloghop. Julie and Donna and I may be having a blogathon that day to raise money for OWH. Stay tuned! Woohoo!! Here we go again! Not sure yet what I will do but will probably do at least a tutorial and a challenge sounds like a great idea! Can't wait - the last one was really fun!! Looking forward to another hop! We've been able to get others involved with the organization thanks to the hops & lots of blog candy, so can't wait to get our numbers up! Looks like my daughter won't be deployed until Dec. to Afghanistan. Can't wait for the blog hop, the last one was so much fun! I am sending off my first box of cards this weekend and I'm excited to participate in the blog hop. I will offer another tutorial and blog candy. Thanks! I like the theme, too! I am having surgery the 28th, but I think my husband can take care of putting the links in for me. If not, do you think I could give you the password for my blog? I trust you implicitly! I just don't want to miss out on anything. I can hop and see when I get home (about the 31st). I have faith that it will all work out! Blessings and love. My first time Participating as a blog in the hop. I've visited and hopped for the first time on Spring Hop. 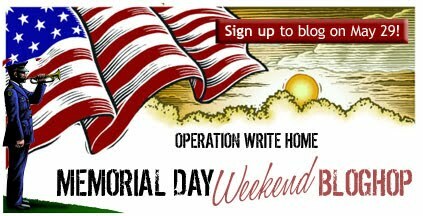 I participated in the Memorial Day blog hop last year and thought it was great! please add my other blog too ! I'm an Army mom with two soldier sons. 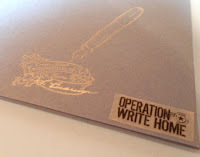 I just discovered Operation Write Home while on Facebook. Thanks for what you do. This is going to be fun! I love to participate on Memorial Day weekend. I'm going to spread the word early and often. This sounds like a lot of fun and very beneficial. THanks for the opportunity to participate in another OWH hop--I'm looking forward to it! I have a digital stamp company and I will be offering a free stamp I made just for this blog hop. I have a hero blinkie on my blog...does that count for number 3 - (obviously in addition to a card and a story or poem, quote whatever. I have never done this before and I'm not sure how it's all done. Will instructions be sent? YOOHOO!! Um but of COURSE I will be doing this with you again!! Karen @ Feline Creative sent me! OWH has crossed my path several times in the past month and I know it's a sign that my cards that are just sitting in a box are destined to go to a soldier who will enjoy sending them to a loved one. Thank you for putting this together!!! I'm very excited. We are a military family and know what it is like for the family of the deployed and the soldier serving his/her country. Awesome that you and so many others help out in this way. View the videos below for inspiration! Watch for a confirmation email NEXT weekend, and an email with your link in it on Thursday the 27th, unless you've already contacted us to get your link early due to vacation. Enjoy this creative little tribute to the day from Tikrit, Iraq! 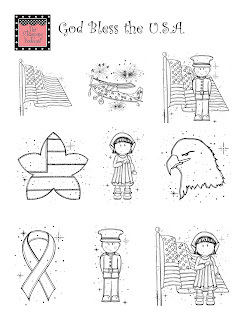 Armed Forces Day was established by President Harry S. Truman, who led the effort to institute a single holiday for citizens to come together and thank our military members for their patriotic service in support of our country. 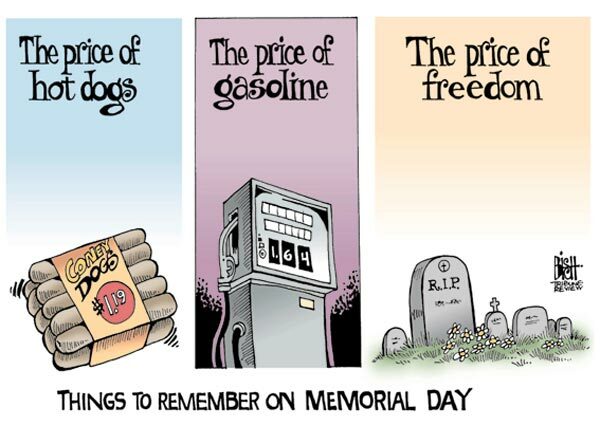 This is aside from Memorial Day, which remembers those who died in service, and Veteran's Day, honoring those who served our nation already. In 1949, Armed Forces Day was established to replace separate Army, Navy, Marine Corps and Air Force Days. The single-day celebration stemmed from the unification of the Armed Forces under one department -- the Department of Defense. So happy birthday, DoD! And thank you to all members of all branches of service, past and present. We honor you all! Download this high-resolution poster to print out, courtesy of the Defense Department! 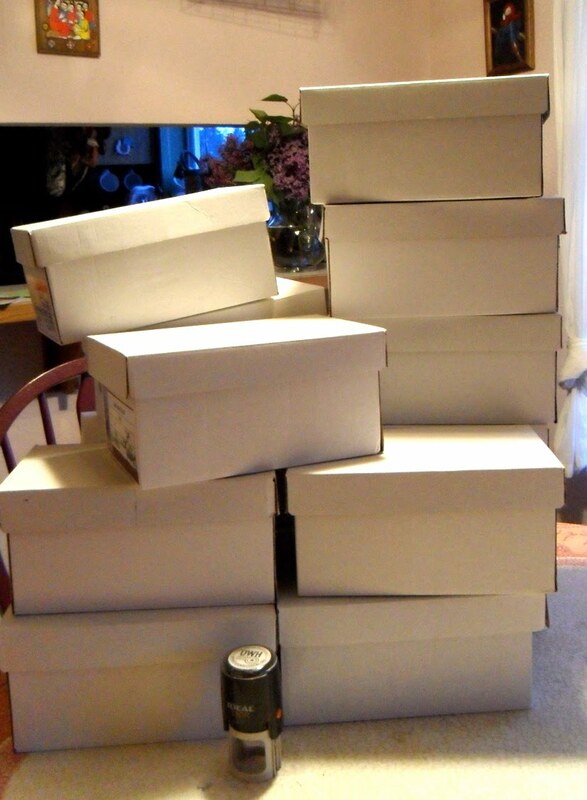 This pile of boxes contains over 1,400 patients discharged from the Card Hospital! Most needed either stamped on the backs, had to be surgically removed from plastic sleeves, or needed light colored liners inside dark cards. Thank you Lynn P of Charlotte, NC for your huge donation of cards! Thank you for supporting our heroes! Lori M, Champlin MN......WOW!! What absolutely FABULOUS cards!!! Lori N and Jean G, Jefferson City MO......thanks ladies for this box of awesome cards!!! Betty T, Salina KS......thanks so much for these gorgeous cards!!! Debby M, Las Cruces NM.....thank you for another box of awesome cards! Judy B, Cleburne TX.....another fabulous box of cards!! THANK YOU! Linda M and Cindy G, Marietta GA.....thank you ladies for the gorgeous cards and for the neatly organized box. Carol H, Vancouver WA - thanks so much for your lovely cards, they'll definitely be loved!! Cindee N in Harrisburg, PA, thank you for these awesome cards for our heroes! Love these cards with flip flops! Too cute! Cyndy R in Contoocook, NH, thank you for all the beautiful cards, generous donation, pens, and stickers! I can't wait to send all these goodies to the troops! Thank you Lauren L. of Plainfield IL for this huge box of cards! Wow, you've been busy! You've filled a lot of holes in my stash! Rebecca S, Munster IN......thanks for the great cards and any hero cards! Amy C, Framingham MA......awesome cards and Any Hero cards!! THANKS! Brenda R, East Bethel MN......another awesome package of gorgeous cards!!! Helen M, Spring Creek NV.....thank you for these great cards! Roberta M, Oconomowoc WI......beautiful cards!!! Love them. Marie M, Cypress TX.....thank you for these beautiful cards!!! Jennifer M, Austin TX....thanks for these great cards and Any Hero Letters! Tereza C, Winfield AL....thanks for the beautiful cards!! Jeanne B and Kids at Winkelman Elementary School......thanks for taking time to make these awesome cards!!! Great Job! Velda S, Mesquite NV, thanks so much for your cards - they'll definitely Make Someone's Day! Thank you Pat L of Voorheesville, NY for the cards, donation, and hero mail! These cards are great! So glad you found OWH! Thank you Erica C in Kenmore, NY for this great collection of cards! Love the miss you cards especially! Thanks too for the Hero Mail! You rock! Julie S, New Oxford PA.....WOW, what awesome cards! Thanks!! Nicole D and 6th graders at Bethany Lutheran Church.....THANK YOU...these cards are awesome!! CBS Care Club, Central Blvd School, Bethpage NY - what a great batch of AnyHero letters, THANKS!! Debi R, Bainbridge NY - love your cards, they're so cute....thanks for the AnyHero ones toooooo! Esther E, Vancouver WA - wow on your cards, you did a fantastic job as always! Thanks!! Ellen H, Vancouver WA, your cards are sooooo pretty, thank you so much! 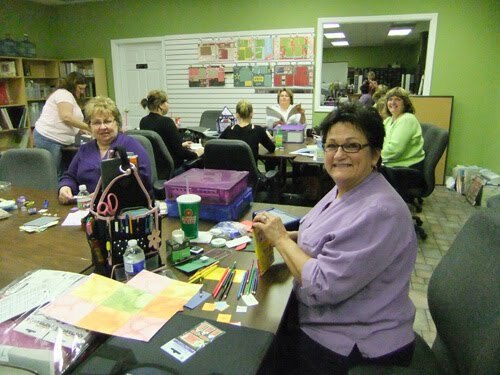 Vancouver WA branch of the Card Hospital - thanks for working miracles!!! Phyllis Z and Lincoln Hills Paper Arts - what a great box of cards, thanks so much! Thank you Luanne F and Brenda J from Henderson, NV for this fabulous collection of cards for our heroes! You rock! Thanks too for the Hero Mail! Thank you Linda B of Columbus, OH for this nice variety of cards for our heroes! Love the cards with flowers! So pretty! Thank you Amy B in Pataskala, OH for these cards! Thanks for thinking of the children! They'll love these cards! Thank you Cathy M. in Akron, OH for these terrific cards for our heroes! Love the purple and green paper! Yummy! Thank you Kara K in Akron, OH for these lovely cards! Our heroes will love these! Thank you Lisa S in Vaughnsville, OH for the cards and the donation! Thanks too for organizing that talented group to make cards! I love the robot cards! Thank you Cristie D and Lillian R in Mechanicsville, MD for the cards, hero letters and donation! These cards will be so appreciated by our heroes! Thank you Tracy C. of Allentown, PA for these beautiful cards! I love the red "miss you" cards!! HUGE thanks to the Ladies of Kennesaw, GA!! Kathie J, Karen V, Kristina V, Tasha W, Jane H, Lynn V, Brindy W, Jeannie S, Patti R, Peggy C, Sharrie E, Sandy F, and Sarah L! Thanks for the beautiful cards and generous donation! Thank Lori W of Brunswick, OH! Your cards are beautiful...they reminded me of sherbet! Yummy cards! Thank you Kaye D. in Indian Trail, NC! Your cards are always just what I need! Love the "just be-claws" cards! See you soon at the LSS!! Thanks Sandy F of Charlotte, NC for these cards for our heroes! You rock! See you soon at the LSS!! Thank you Julie K of Brunswick, OH for this huge collection of cards! WOW! So many pretty designs! Our heroes will love these! Thank you! Many thanks, Jennifer! Your cards are so bright and pretty! They are great cards for summer! Love them! Thank you Kelly S of Copley, OH for these beautiful cards! I needed some wedding cards! Thanks! Thanks, Joyce S. of Akron, OH! These cards are lovely! I really like the dragonfly cards! Many thanks, Shelley I. in Fairlawn, OH for this pretty collection of cards for our heroes! Love the black and white cards especially! Many thanks to Outlines Rubber Stamp Company for the lovely cards and card fronts you sent for our heroes! So many lovely works of art! Linda G, Seminole OK......thanks so much for these great cards! Haylee L, Kellyville OK.....what a great package of awesome cards!!! Hannah M, Naples FL.......another awesome package. Thanks for all the Any Hero letters. Cindy G, Nazareth TX.....thanks so much for your package of cards. Anne B, Forrest Hill New Zealand......wow, these cards sure travelled a long way! They are beautiful....THANKS! Patricia Jones, Killeen TX......thanks for the beautiful cards! Ann M, Hutchinson MN......thanks so much for these awesome cards!!! Kelli D, Paragould AR......thanks for the great package of gorgeous cards!!! Ginny B, Overland Park KS......beautiful cards!! THANKS! Maude B, Las Cruces NM....thanks so much for these wonderful cards! Thank you, Amy P. of Harrisburg, NC!! I can always count on you to make the cards I need to fill my stash! Our heroes will love your cards! Caro H of Mint Hill, NC, thank you for these beautiful cards! They just get better and better! Thank you too for the hero mail! THANK YOU, Joyce K. of Hot Springs, AK for delivering this huge box of cards and box of envies all the way to North Carolina! You rock! So very nice to meet you! Thank you, Kathy P in White Lake, MI!! Three boxes of beautiful cards for our heroes! You are so talented! I love looking at your cards! Pat G. in Upton, NY, thank you for the cards and the hero letter! I especially appreciate the cards you made for the children of our heroes. Thanks!! Thank you Corrie T of Ashburn, VA! Your cards are beautiful! I love the clever embossing on the envelope flaps! I'm going to try that myself! Many thanks, Mary W of Concord, NC! Your cards are beautiful, and our heroes will love sending these back home to loved ones! Thank you Nicole S. of Oakland, ME for these pretty cards for our heroes to send back home! Love the "Thinking of You" cards!! Thank you Meighen M of Bolivar, OH!! You sent such nice cards for our heroes! Thanks too for the bookmarks! I know just who to send those to! Joan J, Lodi CA - thanks for the awesome package of cards!!! Jan R, Modesto CA...your cards are always so cute, thanks so much for them all! Lynn T, Boise ID - fantastic job on your cards, our heroes will love them all! Betty W, Mountain Home ID - thanks for the cards - and getting your friends together to join in the fun! Debbie, Jared, and Jacob, Nampa ID - FANTASTIC job on all these cards, wow! Jennifer H, Boise ID - lovely cards, they'll be so great to write home on - thanks! Kim R, Boise ID, thanks so much for adding your creativity to this big box of cards! Alex L, Boise ID - thanks for convening your stamping friends....what a great box of cards! Thank you to Shannon H in Winterville, ME and all the kids and church members who put together these lovely cards! You sent a lovely collection! Our heroes will love these! Thank you too for the generous donation!! Thank you Pat Q. in Bethel Park, PA!! Your cards are always beautiful, and the red, white, and blue cards really caught my eye with this shipment! Thank you too for writing letters to our heroes! Thank you Terri D of Lewiston, ME! So glad your inner child took over! These cards will be treasures for our heroes' children! Thank you too for the generous donation! Thank you Eileen M and Card Parties for OWH for the cards, the donation and the letters to heroes! Thank you Diane Mc. of Harrisburg, PA!! These cards are incredible! Thank you for sending such a nice variety! Donna D. in Monroe, LA, your cards are so beautiful! Love the cards for dads! Love the felt flowers too! Thank you!! Katherine G. in Lexington, KY, thank you for making these beautiful cards for our heroes! Especially the cards for our heroes' dads! lovely! Thank you Rosey R. in Astoria, NY!! These cards are terrific! Love the cards for dads and grads! So many different techniques! You rock!! Thank you Croppers Delight Scrapbookers in Astoria, NY! I know our heroes will love these clever cards! Well done! Thank you Debb R. in Scotia, NY for these beautiful cards and the donation! These cards for dad's are perfect!! Many thanks, Lisa S. of Jacksonville, FL! Your cards are just what I needed! Our heroes will love sending these back home! Thank you Lois G in Venice FL! You and your friend, Sharon, sent a lovely box of cards! Thanks for the hero mail too! Thank you Sharon A. from Sarasota, FL for the terrific box of cards from you and our friend, Lois! Many thanks for the hero mail too! Cheryl B. of Havelock, NC, your cards are so clever! Love the new fold! Heroes will grab those! Thanks for the hero mail too! Thank you Karen G of Oakland Park, FL for another collection of beautiful cards! Thanks so much for the Hero Mail! Wonderful!! Thank you Jean B. in Meadville, PA for the cards, hero mail and donation! I'll be using your "Dad Cards" for inspiration to make some of my own! Louise F, Frazier Park CA - wow! your cards are always so stunning, and this box is no different! Thanks so very much for your generous donation too! Kemi S, Redding CA - wow, beautiful cards...especially love your coloring!! Jan H, Parker AZ - beauuuuutiful! I just love your coloring, girl! Janice A, Bountiful UT - thanks for your ongoing support - with your pretty cards and faithful donations! Thanks, Tereza C. in Winfield, AL for all these beautiful cards for our heroes! Thanks to for the donation and the Hero Mail! What a lovely box of goodies! Marci S and first graders, Woodinville WA - thanks soooo much for the great cards and drawings!! Thank you Nancy S of Warren, MA for sending these terrific letters from Girl Scout Troop 11015! They rock! Thank you Megan H and the Church of Jesus Christ of Latter Day Saints of University Park, PA for the nice collection of cards for our heroes! Thank you Donna O in Louisville, KY for this huge collection of cards for our heroes and generous donation! So many pretty cards! These will disappear fast! Victoria L, Cullowhee NC - great cards as always, and thanks for the donation as well! Linda B, Burien WA, thanks so much, your camping card just made me grin from ear to ear! Helen R, New York, NY, thanks so much for the Dad cards! Cindy M, Pewaukee WI, your Father's Day cards are right on time - thank you! Carla D, Sublimity OR, thanks so much for your generous donation! Christine W, Sacramento CA, your cards are here - special thanks for the AnyHero ones! Denise W, N Las Vegas NV, thanks for the wonderful box of cards...hope your hubby is feeling better soon! Evelyn C, Ridgecrest CA - thanks so much for the lovely cards! Sally P, Honolulu HI, Thanks so much for your box of cards! Louise Q, Suisun City CA, bless you for all the lovely cards! The borders are adorable! Many thanks to Joyce L and the Colts Neck Senior Citizens of Holmdel, NJ! These cards are super nice, and our heroes are going to love them! Cheryl Y, South Pasadena CA...your cards are so pretty...and your donation so generous! Thank you! Nancy and the 9th graders at Mill Creek Jr High - WOW! You did a great job on all these cards and AnyHero notes, thank you so much!! Linda E, Dillsboro IN - These cards are just lovely, thanks so very much! Love the photos. Pam J, Duvall WA - thanks to you and your friends for the great box full of cards!! Brittany M, Warner Robins GA - great job getting all the AnyHero letters written!! You know how they'll smile, thanks! You're tuned in to find out if you won a prize, right? 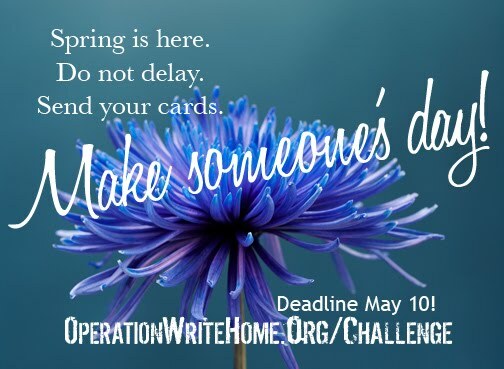 First remember that the real winners of this and every card challenge are our heroes — because of all of our dedicated challenge participants, even more deployed service members have a beautiful card to write home on! The grand total for this short challenge: 5,206 cards! A huge thank you to Marcie K whose ongoing donations of her extra supply prizes are keeping us all excited!! 3330 cards were shipped out this week! That's 10 boxes, shipped at a cost of $125 this week. Please share this video on your blog, Facebook, Twitter, etc - let's get this out to as many military moms as we can! Without further ado...this week's TT list! Thank you Linda B. and Fran M. of the Mad Hatters of the Historic Village of Old Bridge and Christine H, all of East Brunswick, NJ! What a beautiful collection of cards you sent for our heroes to send home to family!! Thank you Bev, Linn, Stacey, Rhonda, and Karen, the Scapbook Concepts Card Makers of Florence, SC!! You all make terrific cards for our heroes! They will love sending these home to family and friends! Thank you too for your generous donation! Thank you Laurie W in Evans, GA for this terrific collection of cards for our heroes! Thanks for sending such a nice variety of sentiments! Love the birds! Lee B, Dalton WI - oh my goodness, you have been BUSY! Thank you so so so much! Donna C. in Leesburg, FL, your cards are lovely! Thank you! The cards with pockets inside for note paper are so clever!! Pat G. in Upton, NY, your perfectly packaged, lovely cards are just what I needed! Our heroes will love these! Thank you for writing notes to Any Hero! Denise I. in Williamsville, NY!! Thank you for this super cute collection of cards for the Make Someone's Day Challenge! Thanks too for the shipping donation and the much needed letters to Heroes! You rock! Thank you, Cheryl K in Beech Island, SC!! Your cards are breathtaking! Our heroes will grab these quickly! Love the googly eyes! Thank you for writing notes to soldiers too! Thank you, Emma L of Millersville, MD and Girl Scout Troop 4058! Your hero letters are well done! What a terrific project for your Bronze Award! Nina L, Sacramento CA, thanks so very much for the Make Someone's Day challenge cards!! Kim N, Bloomington IL, thanks so much for the gorgeous cards!! Paula P, Rathdrum ID, your cards are always so beautiful, thank you so much for the generous donation too! Thank you, Susan S. in Prattville, AL! Great cards and generous donation! I just love the cards with the flip-flops!! Sue A, Rockford IL......another awesome package. You ROCK!! Judy B, Cleburne TX.....thanks for the fabulous cards!!! Thank you, Melissa B in Montreal! So many beautiful cards for our heroes, and they are all unique! Thanks bunches! Jeanine D, Cleveland TN......another wonderful package of beautiful cards! Thanks! Linda G, New Lenox IL.....thanks for all these awesome cards!!!! Polly P, St Paul MN....thanks to the Queen of Stamps for another awesome package of cards!!! Janet P, Lawrence KS.....thanks for these gorgeous cards!!! Love them! Diane S. in Raleigh, NC, thank you for the great cards for our heroes! Love the golf club stamp! Stacy S and friends, Klamath Falls OR - beauuuuutiful cards, thanks so much! 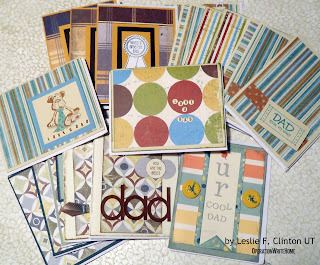 "C" S. of Raleigh, NC, perfect timing for all these Dad's Day cards! All your cards are beautiful! Thank you for your hard work for our heroes! You rock! Vicki W and Treasured Memories Scrapbook Store - WOW! Thank you so much for all the cards from your Friday Night Crop! Diana H, Centennial CO......thanks for these beautiful cards! Love them!! Renee H, Andover MN.....thanks so much for this awesome package of cards! Ann L, Orem UT, so glad to see your mojo has returned! Thanks so much for the cards and donation! Reta M, Fair Oaks Ranch TX.....WOW! What a great box of awesome cards! Sara B, Pearl City HI, thank you for your generous donation!! Thank you Susan A. of Ridgewood, NY! Your cards are always so pretty! Just what I needed! Thank you!! Thank you Caro H for the beautiful cards and the Hero Mail! You always have the cards I need most! Thank you! Linda K, Allen TX.....thanks for the awesome cards!! Love these!! Thank you Joy O in Carmel, IN! That box is chock full of goodness for our heroes! You rock! Lori R in Springfield, VA, thank you for these beautiful cards for our heroes! I love the cards with Snoopy! One of my favorite characters! Thank you, Dolores A in Frederick for the cards, donation and Hero Mail! So many pretty cards for our heroes! I know they will snap these quick to send to family! 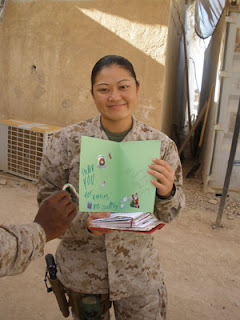 Thank you Seongsook D. in Elk Grove, CA for the cards, donation, and Hero Mail! Your collection os cards always makes me smile! Such talent! Linda G. of Ypsilanti, MI, thank you for the cards and generous donation! So many different techniques! Wow!! Thank you Nancy H and the Stamp4Joy group at St John's Lutheran Church in Fallston, MD! Your cards are beautiful, and they are on the way to our heroes! Thank you Jud K in Oxfordville, WI for the cards and the shipping donation! Your cards are wonderful! Thanks to our donor in Hamburg, PA for the beautiful collection of cards! LOVE all the butterflies! Thank you Mary Sue F. in Lykens, PA! Your cards are just what I needed! Our heroes will love sending these back home! Well done! 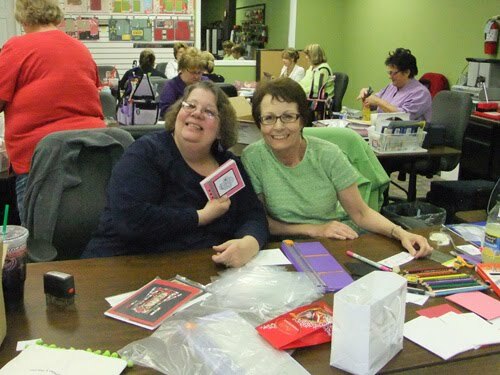 Thank you Eileen M. in St. Mary's, PA and all the participants at the Card Making Parties for OWH. Well done! Thanks too for the letters to Any Hero!! Shirley T, Faribault MN - thanks for the awesome packet of cards, our heroes will love them! Lina W, Hampton VA - love your cards - especially the Cinco de Mayo pup! Cute! Wow, Julie Y of Selma OR - your cards are beautiful, thank you! SuzAnn H, thanks soooo much for your generous giving!! Danyse K of Charlotte, NC, thanks for these terrific cards, hero letters and donation for shipping! Great job! Good to see you again too! Debby P, Buffalo MO - thanks so very much for your generous donation! Janice A, Bountiful UT......thanks for sharing your great Father's Day cards with me, I'm sure Sandy doesn't mind! Marnel A and friends, Renton WA - thanks for your two packages of cards, they're just lovely! Our heroes will enjoy them! Roxanne B, Rockport TX......thanks for these great cards! Love your style! Pam B of White Lake, MI, I do believe you are right! These were made with love, and it shows! Well done! Kathie B, Fremont CA......thanks for the pretty cards!! Nancy C, Hollister CA - I always look forward to your boxes of beautiful cards, thanks!! Leigh E, Houston TX....thanks for these awesome Any Hero notes. These will bring smiles to those that read them. Lily H of Pittsburg, PA! Your cards are just delightful! I bet our heroes will grab these quick to send home! Thanks for making my job easy! Cheryl K, Crest HIll IL......thanks for the Any Hero letters and the awesome cards!!! Linda K, Grant MI......another geat package of cards!! Thanks for the Any Hero notes! Thank you Corinna L-R. of Westville, IL for these terrific cards for our heroes! I really like those "Hello" cards. Such a pretty flower! Jennifer M, Romeoville IL......thanks for the great cards and Any Hero notes!!! Thank you, Janet M. of Biddeford, ME!! Your cards are lovely! And so well organized! I loved the card with the dragonfly!! Thanks, Dawn M. in Charlotte, NC for the beautiful cards and the letters to heroes! Just what I needed! Jennifer M, Marshfield WI...thanks for the awesome cards!!!! Love them! Julie O and Knapp Haven Nursing Home Residents.....thanks for the great cards!!! These are wonderful! Thank you Shelley R. in Nutter Fort, WV for such a lovely collection of cards and the mail for Any Hero! So many different sentiments! Michele S, Lisle IL.....thanks for these cute cards!! Nancy T, Katy TX.....thanks for these awesome cards and Any Hero notes. 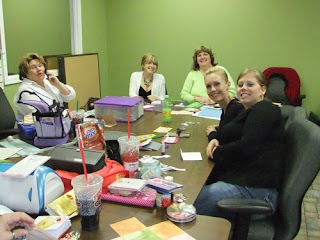 Karen T and everyone at Paradise Scrapbook Boutique - wowowow! You are all so talented...thank you for your huge box of cards, plus all the AnyHero letters!! Lisa W, McKinney TX......these are such pretty cards!!! Kyndie W, Downers Grove IL.....thanks for the nice cards, love them. Many thanks to Mary Ann A. and Daisy Troop 772 of Lawrenceburg, KY for the beautiful cards and the letters to our heroes! I just love it when the little ones write to our troops! Thanks too for the donation for shipping! Kay C, Minnetonka MN.....another fabulous package of cards! Thank you! Lindy C, Seattle WA - wow another beautiful box of cards!!! Thank you so much!! Chris F, Monument CO.....WOW! what a great package of cards!!! THANKS! Barbara H, Milton WI.....gorgeous cards! Appreciate the Any Hero notes as well!! Thank you Debbie K. in Burke, VA for the cards, Hero Mail, and generous donation! I just love the birthday stamp, "2U" Terrific! Sandi M, Fremont CA.....an awesome package of beautiful cards and Any Hero notes!! Ellen P, Vernon Hills IL......thanks for the great Father's Day cards and Any Hero notes!! Paula S. of Stamford, CT!!! Love these cards! Thank you for the cards and the shipping donation and the letters to heroes!! These "Dad" cards are the bomb!! Thank you Debbie T and all the croppers at Family Memories in Charlotte, NC! Great cards and a generous donation! These cards are beautiful! Well done! Lesley T, Kirkwood MO.....thanks for these great cards!!! The event was at Treasured Memories, Inc. (TMI), one of our local scrapbook stores, and was attended by 15 people. 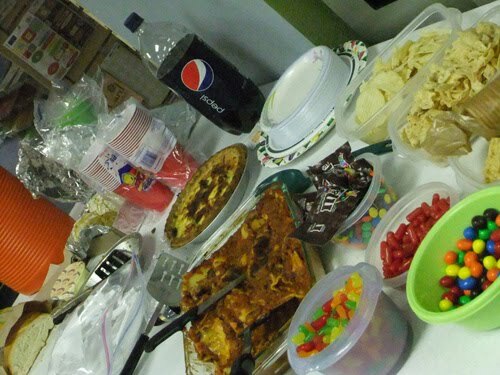 We worked from 6PM to 1AM, one lady brought lasagna and quiche, I made cookies, and a good time was had by all. I didn't post it on the OWH site or blog beforehand, because we are such newbies at the event we wanted to try one out first to see what worked/didn't work, and it was truly a learning experience! Before mailing the box, I checked everything for liners and needed repairs. It was amazing to me how many different end results can come out of the same product! What fun! I just stamped and stuffed and lined cards all night long. I really want to get people here in Reno involved in this project, nobody at the crop had ever heard of it before, I guess they don't read Paper Crafts or CK. Cards made at the event: 151 WOW! Thank you Victoria and friends! The cards are here and are beauuuuutiful! We've been blessed with more great coverage of our work that will get the word out to even more crafters! Thank you CK! 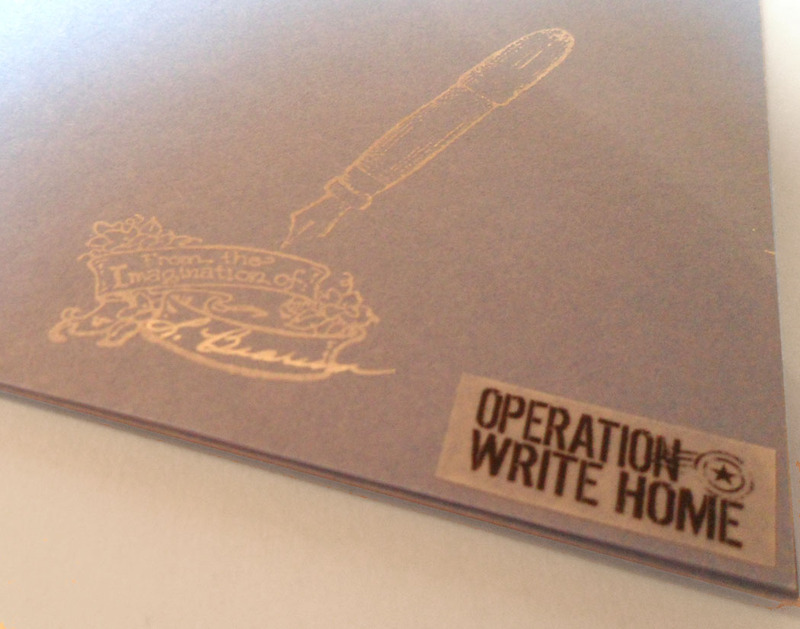 Are there publications you could write a letter to about Operation Write Home? 8,220 cards were shipped out this week! That's 25 boxes, shipped at a cost of $312.50 this week. A quick note...we can still use more Father's Day cards! And LOTS more AnyHero cards. 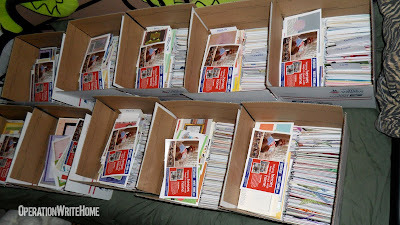 The boxes pictured in the photo above used up almost every AnyHero card in Washington...think about it, 20 letters in each of 10 boxes = 200 letters a week! Our NC and KS shippers are in the same boat! Remember that the end of the school year is a great time for your kids' teachers to have a fill-in activity writing letters to our heroes!